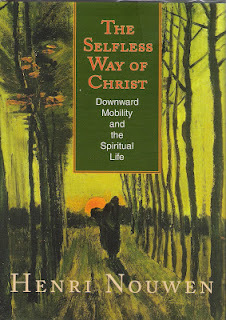 I recently finished a great little book by Henri Nouwen, The Selfless Way of Christ. We are taught to conceive of development in terms of an ongoing increase in human potential. Growing up means becoming healthier, stronger, more intelligent, more mature, and more productive. Consequently we hide those who do not affirm this myth of progress, such as the elderly, prisoners, and those with mental disabilities. In our society, we consider the upward move the obvious one while treating the poor cases who cannot keep up as sad misfits, people who have deviated from the normal line of progress. The story of our salvation stands radically over and against the philosophy of upward mobility. The great paradox which Scripture reveals to us is that real and total freedom is only found through downward mobility. The Word of God came down to us and lived among us as a slave. The divine way is indeed the downward way. The disciple is the one who follows Jesus on his downward path and thus enters with him into new life. 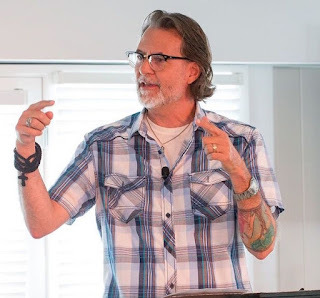 The gospel radically subverts the presuppositions of our upwardly mobile society. It is a jarring and unsettling challenge. Three temptations by which we are confronted again and again are the temptation to be relevant, the temptation to be spectacular, and the temptation to be powerful. Who am I when nobody pays attention, says thanks, or recognizes my work? I think that question sits at the root of our spiritual malaise and weakness. We want people to pay attention to us, to recognize us, to give us our due. This is how our identities, worth and significance are grounded. We want to be relevant, spectacular or powerful. So we go through life fishing for such things, a grasping that keeps knocking us off center, spiritually speaking. Make it your ambition to lead a quiet life. The juxtaposition here is interesting. Make it your ambition to lead an unambitious life. One of the most impactful parts of the book is Nouwan's reflection on the temptations of power. As Nouwan observes, "There is almost nothing more difficult to overcome than our desire for power." It seems nearly impossible for us to believe that any good can come from powerlessness. In this country of pioneers and self-made people, in which ambition is praised from the first moment we enter school until we enter the competitive world of free enterprise, we cannot imagine that any good can come from giving up power or not even desiring it. The all-pervasive conviction in our society is that power is a good and that those possessing it can only desire more of it. Surrounded by so much power, it is very difficult to avoid surrendering to the temptation to seek power like everyone else. But the mystery of our ministry is that we are called to serve not with our power but with our powerlessness. It is through powerlessness that we can enter into solidarity with our fellow human beings, form a community with the weak, and thus reveal the healing, guiding, and sustaining mercy of God. We are called to speak to people not where they have it together but where they are aware of their pain, not where they are in control but where they are trembling and insecure, not where they are self-assured and assertive but where they dare to doubt and raise hard questions; in short, not where they live in the illusion of immortality but where they are ready to face their broken, mortal, and fragile humanity. As followers of Christ, we are sent into the world naked, vulnerable, and weak, and thus we can reach our fellow human beings in their pain and agony and reveal to them the power of God's love and empower them with the power of God's Spirit. 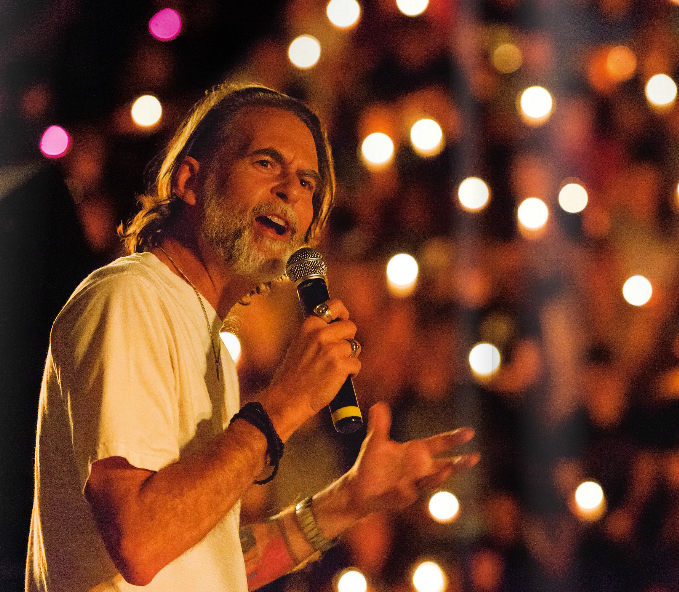 "...and thus we can reach our fellow human beings in their pain and agony and reveal to them the power of God's love and empower them with the power of God's Spirit." I just finished "The Quest for the Radical Middle," the history of the Vineyard Churches, and maybe that gives me a different reading of the notion of "empowering them with the power of God's Spirit" than is intended by Nouwen. Or maybe not so much: as a Catholic priest, he would have at least had the category for seeing the Church Militant as a manifestation of real institutional power and influence, centered on the weakness of Christ in the Eucharist. Either way, I'm interested in explorations of what people think "empower them with the power of God's spirit" means. When I read things like this in isolation, I tend to take it as meaning a kind of gentle inner comfort, or merely the capacity to endure, or inner peace, rather than the ability to intervene and change situations in meaningful and surprising ways...more Transcendental Meditation than Civil Rights Movement. But I'm not sure that is Nouwen's intent here. To clarify, surely an essentially Christian act is not one done from a position of powerlessness. That would make the parable of the good Samaritan unchristian. An essentially Christian act, it seems to me, is one done from disinterested love--where power, relevance, and social position can be essential to the act, but not the motive. This can be crucial as a Nietzschian critique makes clear: if downward mobility (ultimately powerlessness) becomes a goal--rather than a possibility to which a Christian is indifferent--then we are still oriented to power. Of course, there may be no better way to show that power and position are not one's motives than to do as Christ and Francis did (and as Christ required of the rich young ruler), but does that make seeking powerlessness in the world the goal, or an instrumental strategy for christian leaders, who should not be identified with upward mobility, lest the opposite confusion be made? (I mean: that power is their motive vs. that not having power is their motive, which I think leaves the door to Nietzsche's critique open.) So maybe the downward mobility thing is essential--but only for Christian leaders, while the rest of us plebes practice indifference? But I am not sure on this. Thanks for this Richard. I'm struck by how this "downward mobility" might be on utter display this week as we worship Christ entering Jerusalem not on a warhorse but on a donkey. I think you're and Nouwen's insights might just find a home in my own thoughts around Palm Sunday this week. Are you familiar with Kathy Escobar's book "Down We Go" which is a similar call to action? Thanks for this well timed post and for giving me something to meditate on for the next while. I agree that the gravity of upward mobility pulls the church into malaise and weakness, however, this is the same thing I see outside of the church as well. It's the same conversation. We have lost the will to live un-ambitiously. Relevance, spectacle and power are the pillars of contemporary thought. Jesus stands against such things in a way that I easily forget. Love this post! It touches the "why" of why I want to be like Christ and follow him. This is maybe a bit off-topic, but I've noticed that you often call books you discuss or review "little books" or even "great little books." What are you communicating with the "little"? Relevant, spectacular, powerful - aren't those the three temptations in the wilderness? This book of Nouwen's that you feature sounds an awful lot like his In the Name of Jesus. He has the same three temptations there. Any thoughts? As an artist, I'm not sure how I feel about this. I mean, an artist's main job is to tell the truth. Telling the truth is always relevant, though not always appreciated. And power is only occasionally a side effect of good art -- not everyone gets to be bigger than Jesus. But... darling, if you're not spectacular, no one's going to look at your work. And then what's the point of making anything at all? Jesus didn't live a quiet life. He was very vocal with his teachings. He had a massive following that he held complete control over. Jesus had a non-typical approach to power, but he was far from being powerless. He held more power in human communities, and less in the oppressive abstractions that have governed man since the agricultural revolution. It seems that downward mobility is not an investment in powerlessness, but more an investment in the power of human communities (as opposed to military and economic power).